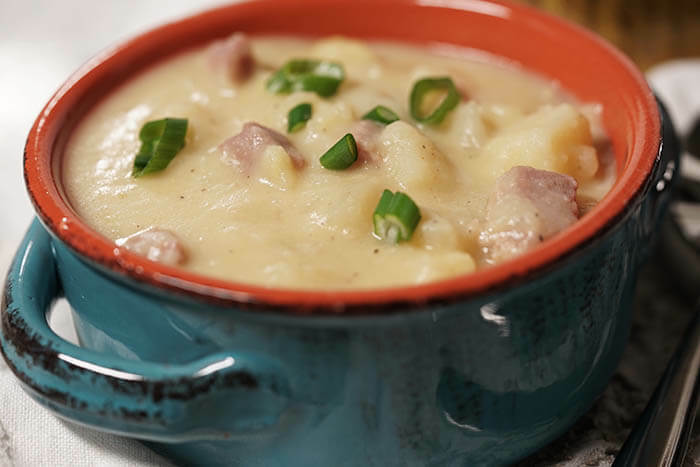 Potato Soup with Ham is a savory, thick soup made creamy with Yukon Gold potatoes and thickened with starchy russet potatoes, a healthy serving of ham with a bit of cheese, it’s an easy soup to make! Hearty and delicious this is an easy weeknight meal! 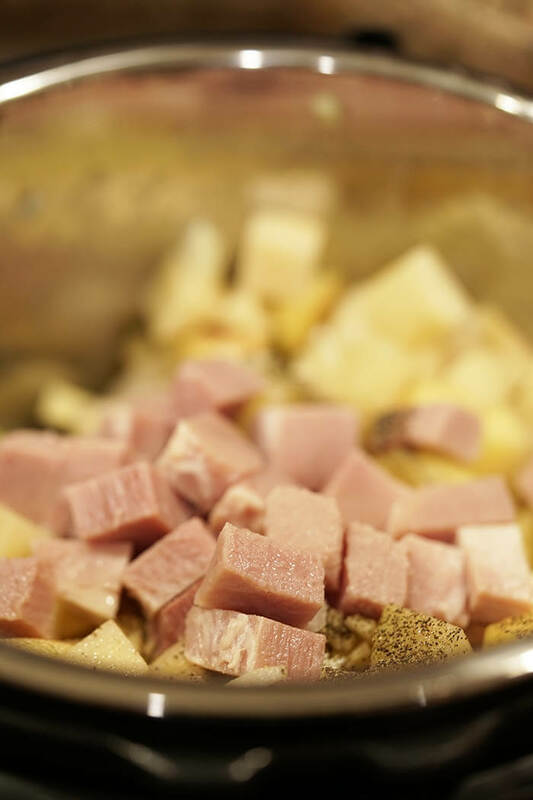 Potato Soup with ham is a savory, hearty delicious bowl of soup made in the Instant Pot or your pressure cooker. I have a new edition to the blog that I’m really excited to share with you. It’s all about pressure cooking! 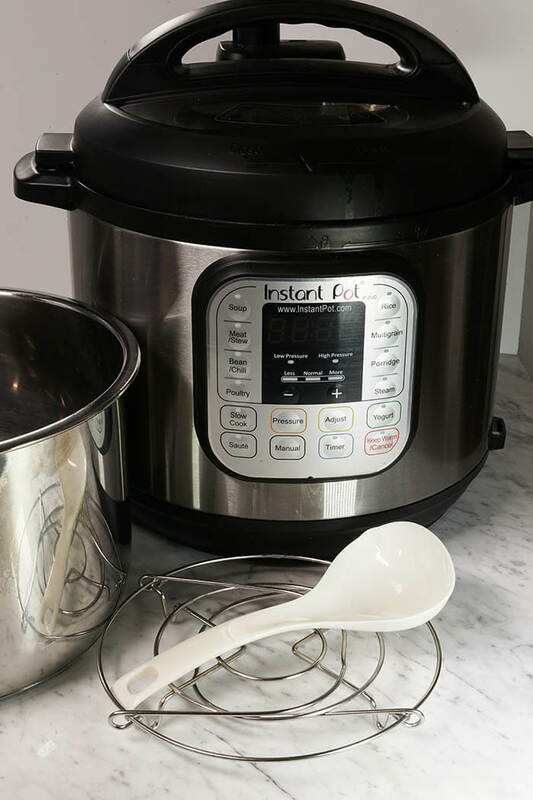 Have you heard of an Instant Pot? It’s the latest thing in cooking, and I’m not a person to jump on the band-wagon, but I love this piece of equipment. I received my pressure cooker, an Instant Pot as a gift in September. It’s a sharp looking piece of equipment and I proudly set it out on my countertop to display it because it is shiny and pretty…. and there it sat for two months. I was afraid to try it. Pressure cooking = scary, right? I contacted a colleague and she gave me two super easy recipes to try, one was for Meatballs in Gravy and Instant Pot Taco Pasta. Making these recipes would take away the “fear” associated with using a pressure cooker. The recipes turned out great and I was proud that I gave it a try! Then I promptly displayed it on the cupboard for another two months until Thanksgiving Day…. On Thanksgiving while cooking our holiday meal I heard a loud POP and then three beeps from my oven. I walked over to the oven and realized somehow the broiler had turned on all by itself…. And the oven door locked itself…. And the cancel button on the front of the oven would not turn the oven off! Dan was off to get his Mom. I was home by myself. Frankly I panicked. Especially as I watched the casserole inside the oven go from golden brown to black and begin to smoke. Should I call the fire department? I did the only thing I could think of – I ran to the breaker box and shut off the power to the kitchen. Thankfully it worked! The motherboard was fried….literally. We were lucky the house didn’t burn down. Long story short, it took five long weeks to get the oven repaired. In that time I decided it was time to figure out this whole instant pot pressure cooker thing! I’m so glad I was forced into learning this piece of equipment, haha! The most popular soup on the blog is my Vegetarian Potato Soup and I decided since it’s such a favorite, it would be perfect to share a meaty potato soup recipe with you first! I think you’re really going to love it! No pressure cooker, no instant pot? No problem, you can make this on the stovetop or in your slow cooker. What’s the advantage of the pressure cooker? It cuts the cooking time in half! Unlike the slow cooker, everything doesn’t turn into a mushy paste without texture! Because this is a new venture for me (and quite possibly for you!) Here are step-by-step directions so you can easily make this at home. Turn the Instant Pot on sauté. Allow to heat one minute. Add the diced onion, celery and potatoes. Sauté for two minutes. Next the ham goes in. Add the garlic, salt and pepper, stir well – saute for another 30 seconds. Add the ham and chicken stock. Stir well. Add the lid to the Instant Pot. Seal completely. Turn the vent to seal. Change setting to steam and set the timer to 11 minutes. When the timer goes off. Do a quick release. Allow all of the steam to release. Mash the potato soup until it is creamy. When the steam is completely released, remove the lid. Add the cheese and half and half. 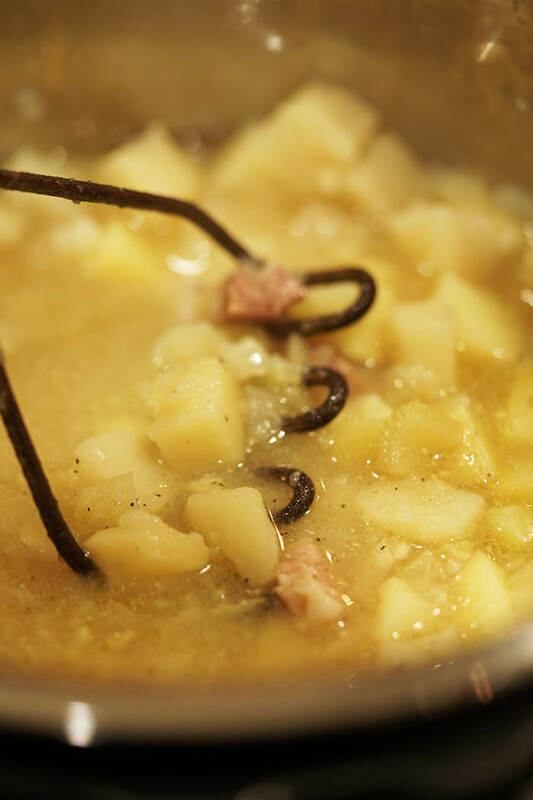 Using a potato masher, mash the potatoes until the soup is the consistency you desire. If you’re looking for a creamy, thick and savory soup this is a delicious meal! The Yukon Gold potatoes offer a creamy texture and the starch from the russet potato help thicken this soup. Using an old fashion potato masher ensures you still have some texture. With a healthy serving of ham with a bit of cheese, this is an easy soup to make! 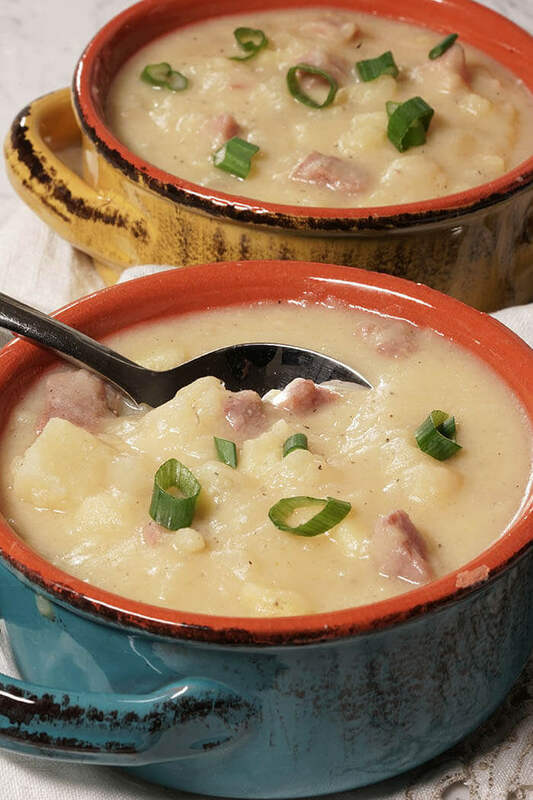 Potato Soup with Ham is a savory, thick soup made creamy with Yukon Gold potatoes and thickened with starchy russet potatoes, a healthy serving of ham with a bit of cheese, it's an easy soup to make! Clean and dice the onion and celery, mince the garlic. Turn the Instant Pot on sauté. Allow to heat one minute. 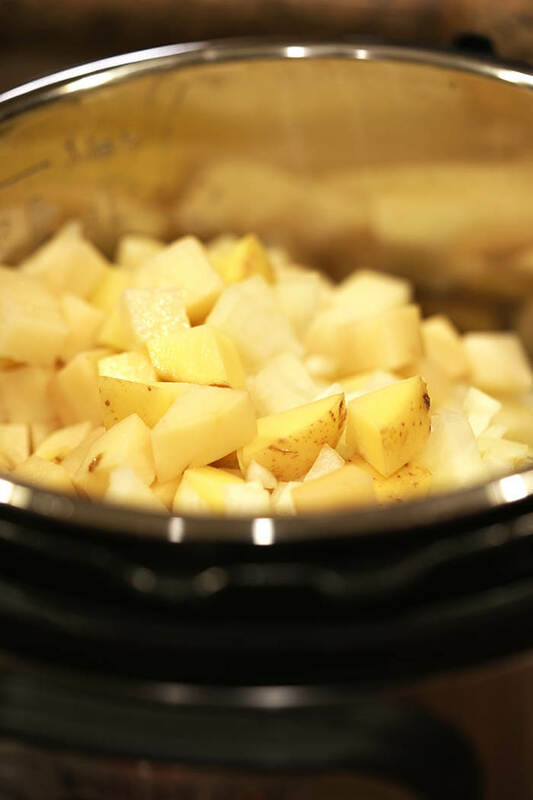 Add the olive oil then the diced onion, celery and potatoes. Sauté for two minutes. Add the garlic, salt and pepper, stir well - saute for another 30 seconds. Add the ham and chicken stock. Stir well. Add the lid to the Instant Pot and seal. Turn the vent to the seal position. Change setting to steam and set the timer to 11 minutes. When the timer goes off. Do a quick release by opening the vent valve. Allow all of the steam to release. When the steam is completely released, remove the lid. Add the cheese and half and half. Using a potato masher, mash the potatoes until they are the consistency you desire. Check the seasoning. You may need to add an additional 1/2 teaspoon of salt. Add Tabasco sauce if desired. Stir again, serve and enjoy! This is a full pot of soup! Please keep in mind the Instant Pot will take several minutes to come to pressure 10-15 mins. and another 5-10 mins. to release pressure at the end of the cooking time and plan your meal accordingly. Enjoy! 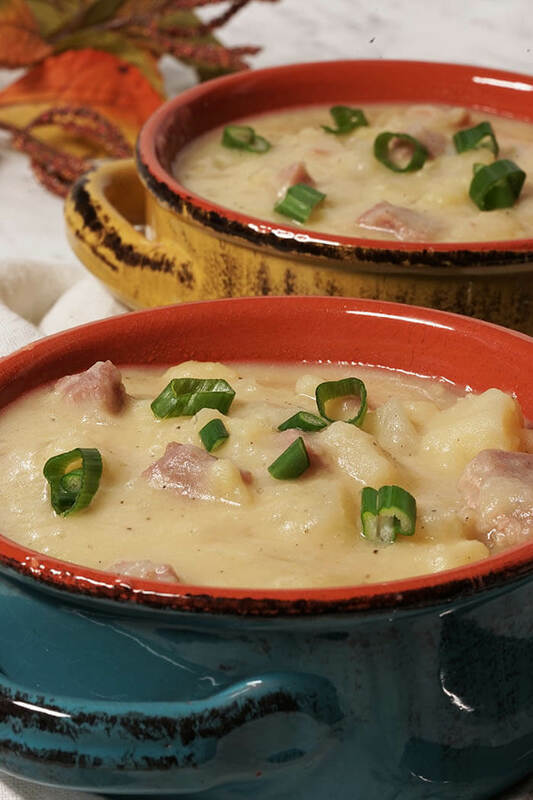 Potato Soup with Ham is a savory, thick soup made creamy with Yukon Gold potatoes and thickened with starchy russet potatoes, a healthy serving of ham with a bit of cheese, it’s an easy soup to make and so delicious! I’ve got my instant pot ordered so will be making this and many other good looking things very soon. Wonderful! How exciting for you, I think you’re going to really love your Instant Pot!! I love potato soup!! I am just getting used to my IP — and I love your step by step directions. Thank you for making this so easy!! Going on the menu!! The IP does take some getting used to doesn’t it? There is a bit of a learning curve, but once you’ve gotten used to it you’re just going to love it! Definitely give this soup a try! Well, a holiday oven mishap is a major push to start cooking with your IP! Don’t you love it now? 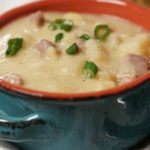 I’m having so much fun with mine and look forward to trying this potato and ham soup! I absolutely love it now! I can’t believe how versatile it is and how easy it is to use. I hope you really my ham and potato soup recipe Sandra! Mmm I love this!! Perfect for this chilly weather! Absolutely, soup is good food! Potato soup is so hearty and delicious. I love the addition of the ham and that it’s made in an instant pot!! Super hearty Christie this soup is just delicious. I hope you give it a try! I think I may be the the only person that doesn’t yet have an instant pot! They sure to seem to make meals super easy! And this soup sounds amazing!!! And here I thought I was the last hold out! 🙂 I’d sure recommend one Angela, I really love mine!! This has convinced me that I definitely need to get an instant pot! I love potato soup and could eat it all day long! You definitely need an Instant Pot Jennifer! I just love mine! Instant pot recipes are the best! I have to make this for dinner! I completely agree! It took me a while to jump on the bandwagon for the IP, now I’m totally sold! Mmmm, potatoes and ham just sound like they go together so nicely. I am loving the Instant Pot recipes you are making. I am now starving! Oooh this one is so good! I hope you give it a try. Thank you Sandi! I made this tonight and it was AMAZING! Everything was perfect. I followed the exact recipe for my Instant Pot and wouldn’t change a thing. The only thing- the IP takes SEVERAL minutes to come to pressure and actually start the count down. While the cook time is 11 minutes, I would add at least 10-15 minutes to the total overall time to pressurize and depressurize. I will make this often!! Oh and one last thing- you had 1 tbsp olive oil on the ingredient list but didn’t mention it in the recipe. I assumed this was to sauté the onions/celery/potatoes in. Just an FYI. Got it, thank you for catching that Sara!!! Oh Sara, thank you so much for swinging back and letting me know! I so appreciate it – this soup is SO GOOD and so easy too. Great point on the timing – I’m still hammering out the best way to write these IP recipes. I will go in and update it next. Have a great day!